The below artworks are the most important by Nadar - that both overview the major creative periods, and highlight the greatest achievements by the artist. Artwork description & Analysis: In this early caricature, a succession of men and a dancing harlequin march toward the mythical Mount Parnassuss (Montparnasse is also the name the Parisian arrondissement). With small bodies and large exaggerated heads, the group moves across the page from right to left. The figure leading the way, his followers quite literally "hanging on to his coattails", is the Romantic writer Victor Hugo (author of The Hunchback of Notre-Dame). The text below the caricatures includes witty commentary and anecdotes about the figures (some even provided by the subjects themselves). Published in Charles Philipon's satirical Parisian newspaper, Le Journal pour rire, this caricature is part of a series entitled Lanterne magique commenced just two months after the ban on political caricature was instituted by Louis-Napoléon (Napoléon III) in late 1851. With political satire no longer an option, Nadar looked to contemporary society and its fascination with the new crop of writers, poets, artists, and intellectuals. Each installment of the series included a strip with five or six caricatures arranged one after another as if on a slide to be projected in a magic lantern (Lanterne magique). A common form of entertainment in the 19th century, the magic lantern projector was also used as a tool for educating the public. Like the magic lantern show to which it refers, Nadar's Lanterne magique illuminated the cultural milieu of Second Empire Paris. As scholar Adam Begley put it, "implicit in the conceit [...] is the parallel between the way a magic lantern enlarges an image on a slide and the publicity generated when a newspaper prints a successful caricature of a public figure. 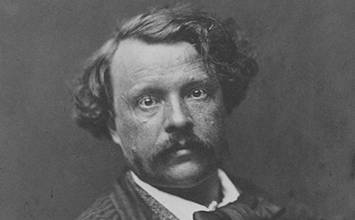 In short, Nadar was operating a machine for magnifying the exposure of celebrities." Although early installments included writers and journalists, later iterations featured artists, musicians, and other prominent men. Published over the course of a year, the procession of important cultural figures, always in the same oblong, sequential format, included some three hundred figures. Artwork description & Analysis: Led by Victor Hugo, a group of 250 writers, including Nadar himself (seated behind a sign in the second row from the top), are pictured marching downward where they come to stop in front of the busts of storied Parisian writers, François-René de Chateaubriand, Honoré de Balzac, Frédéric Soulié, and George Sand. Building on his previous work, Nadar's Pantheon was a large-scale group portrait that would include nearly one thousand prominent Parisians. According to writer Maria Morris-Hambourg, it was intended to "mirror the contemporary scene more completely than all the existing galleries, museums, and biographical collections of illustrious contemporaries." Morris Hambourg added that "At this moment, when the press had promulgated the fame of the individual far beyond his immediate circle, when romantic notions of the heroic artist had become the heritage of a newly mass public, and when Paris reigned as the capital of the cult of personality, the project of a grand and clever portrait gallery of the great was exactly apropos." Bringing together original and existing caricatures, and a compilation of biographic and anecdotal materials, the completed work was presented on a single sheet measuring approximately 32 x 45 inches. The enormity of the task was more than Nadar could manage or afford on his own. In fact, it took nearly two years to complete what was the first of two enormous lithographs (he in fact had planner for four). At a subscription price of 7.50 francs (or 12 francs after publication), the Pantheon appeared in shops with much fanfare in March of 1854. It was a huge success, selling in vast numbers in the first six months, and Nadar became an instant celebrity. If his Pantheon was intended to capitalize on Paris's cult of personality, he had indeed joined their ranks. Despite the success of the first installment, however, the project produced only a modest financial windfall. By the time he paid the small army of people involved in the Pantheon's production, and due to copyright complications that saw the work withdrawn from sale, the Pantheon was not the financial success it should have been. It was clear that Nadar would not be able to raise the necessary finance for the remaining three installments though he did produce a second Pantheon made of existing and new photographic portraits including those of Gustave Doré, Charles Baudelaire, Théophile Gautier and Eugène Delacroix. Artwork description & Analysis: In this image, Pierrot, a well-known mime, dressed in his iconic flowing white costume and white face makeup, appears still, as if caught in mid-stride. A play on the exaggerated poses typical of a mime's performance, but also the extended stillness required for the long exposure, Pierrot Running is one of a series of photographs of the famous mime that feature a range of dramatic poses and facial expressions. Taken with a large format camera Nadar purchased for Adrien's studio, many of the photographs from the series are remarkable for the size of their scale (8 ¾ x 8 ½ inches). The full-length portraits were intended to take full advantage of the large paper. Pierrot, Charles Debureau, son of Baptiste Debureau, the famous mime who performed at Théâtre des Funambules, would have been familiar to Parisian visitors. French editor and critic Ernest Lacan, in his famous passage on Nadar, spoke of their presence at world's fair (the 1865 Exposition Universelle) : "But amidst all these examples, those that have most aroused the interest of the public, those that few viewers have passed without stopping, are the Pierrots [. . .] Each of these prints is an admirably rendered study of expression [. . .] There are, under the comical exterior of these specimens, great difficulties overcome and beneficial results for art." There is some question regarding whether or not this particular series of photographs can be attributed solely to Nadar or to his younger brother, Adrien. Having set his brother up in a photography studio in 1854, the two collaborated for period between 1854 and early 1855 and the photographs of Pierrot were part of a publicity campaign intended to spur interest in the new studio. The photographs of Pierrot were exhibited at the world's fair held in Paris in 1855. Although the photographs of Pierrot were a collaborative effort between Nadar and his brother, when they won a gold medal at the Exposition the credit was given to Adrien who went under the name "Nadar jeune" ("Young Nadar"). Artwork description & Analysis: In this seated portrait of Charles Baudelaire, amongst the most iconic of the legendary poet, novelist and essayist, Nadar depicts his friend in a casual pose with one hand at his face and the other clutching a cut of white cloth as he looks toward the camera. Nadar had met Baudelaire in 1842, which he later described in his book Charles Baudelaire intime (The Private Baudelaire). "Suddenly our conversation stopped, halted by the sight of a strange, ghostly figure [. . .] We saw a young man of medium height with a good figure, all in black except for a russet scarf, his coat scrupulously cut, excessively flared with a roll collar from which his head emerged like a bouquet from its wrappings [. . .] In his hand in its pale pink - I repeat pink - glove, he carried his hat, made unnecessary by the superabundance of curling, very black hair that fell to his shoulders - a mane like a waterfall. So we were going to meet him, this much awaited figure, this supreme attraction!" This early portrait was taken not long after Nadar separated from his brother's photography studio and began inviting his friends and family to sit for their portraits in his home on rue Saint-Lazare. He was most interested in these early portraits with putting his subjects at ease rather than produce the stiffly posed portraits that characterized early commercial portraiture. From the comfort of his sitting room, Nadar was better placed to produce more intimate portraits of his fellow artists and writers. These were rarely commissioned portraits, many paying only a fraction of the fee charged to wealthier clientele (typically 100 francs). As Maria Morris Hambourg has noted, "warmed with past memories and mutual regard, old friends naturally responded to Nadar's seductive energy, his jokes, his endearing stories, his complete attention. They participated in the performance, returning his concentration and trust. In such encounters with the members of his chosen family, it would not be too much to say that Nadar gave himself over to love." Artwork description & Analysis: One of a series of over one hundred photographs Nadar took in the catacombs deep below the streets of Paris, the image shows row-upon-row of human skulls. Despite a complete lack of natural light, the long passageway on the left is clearly illuminated. And as the handwritten note at the bottom of the photograph attests, Nadar made the photograph with the help of a magnesium lamp of his own invention. The bright light in the background of the image draws the viewer in, giving us a sense of the depth and scale of the "cities of the dead" that sprawled beneath the feet of Parisian city-dwellers. Opened in 1810, the catacombs were brought into use due to increased concerns over overcrowded cemeteries in Paris. To remedy the situation, city officials transformed former underground quarries to house skeletons. It is said that nearly six or seven million skulls lined the walls of the catacombs. Despite its macabre associations, the catacombs were an instant attraction for both artists and the inquisitive onlooker. Although it was officially closed to the public in 1830, artists like Nadar still found ways to gain access. Nadar once noted that it was "one of those places that everyone wants to see and no one wants to see again." and his photographic reproductions were a hit with the public. Already known for his unusual and surprising images, Nadar took his camera to places never before seen by the Parisian public. Meanwhile the catacombs project proved the perfect vehicle for demonstrating the possibilities for photography aided by electric light. Artwork description & Analysis: In this portrait of Sarah Bernhardt, Nadar poses the actress against a simple dark backdrop, with her arm resting on a column that reaches just above waist height. Carefully composed and staged, the twenty-year old Bernhardt - still only on the cusp of international stardom - is swathed in billowing velvet fabric. One of a series of photographs, Bernhardt glances to her side (in others she looks straight into the camera) while Nadar uses his camera to emphasize the young actress's face and flowing dark hair. She appears deep in thought which thus illustrates Nadar's desire to explore "the psychological side of photography" through portraiture. Taken after Nadar's move to a large studio on the boulevard des Capucines (in 1860), the portrait reveals the elements that became the signaturesof Nadar's mature portraits: namely the column as a prop for the sitter to steady themselves, and the use of frontal artificial lighting set against a neutral backdrop. Although Nadar is said to have been on hand to personally oversee Bernhardt's sitting (by this time he was often out the studio and left the day-to-day operations to assistants), the photograph makes clear that he had standardized his studio's approach to portraiture. The casual rapport he established with his famous sitters transcended the formal pose that had characterized studio portraiture hitherto. Moreover, Nadar's photographs of celebrities like Bernhardt were part of a larger commercial strategy that was unprecedented in the nascent field of photographic portraiture.